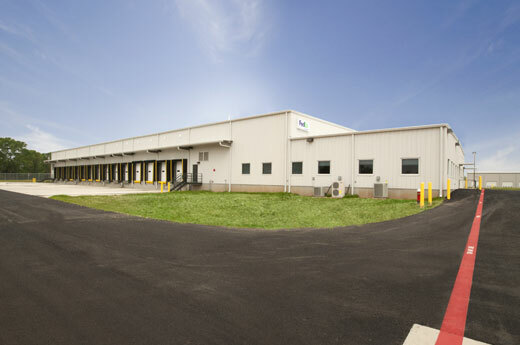 Alston Construction built a new distribution center for Fed Ex Ground in Bryan, TX. The 56,767 SF project on an 8.6 acre site includes a 52,707 SF distribution and warehouse space and a 4,060 SF administrative office. The structure is a pre-engineered metal building, protected by a dry pipe fire protection system. The building is served by a 600 amp electrical service. The warehouse slab on grade is 6” concrete reinforced with macro synthetic fibers. The warehouse is served by 15 dock positions and eight drive-in doors. The warehouse slab on grade is sloped to 248 lineal feet of cast iron floor drains.